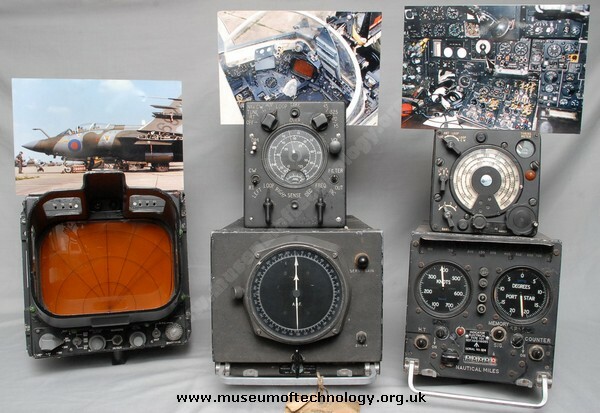 The item on the lower left hand side is an Indicator Azimuth and Range, part of the Blue Parrot ARI5930 and remained so with minor changes through the update of 5930/1 and /2. I was the last Design Authority for this Ferranti Radar System. The item was fitted toward the Port side of the Rear Cockpit. I worked in the Blue Parrot Radar Bay at RAF Lossiemouth in the early 80's. The display in the bottom left of picture is the Blue Parrot Display. The display in the bottom right is the Blue Jacket Doppler system display. Not shown but was situated between the Nav's knees would be the Paveway Laser Designator display.